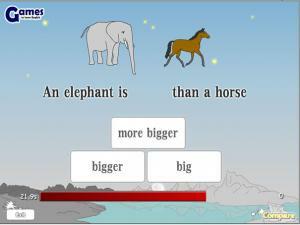 Practice using comparatives in this grammar game. Try to beat the clock by choosing the adjective that correctly completes the sentence! 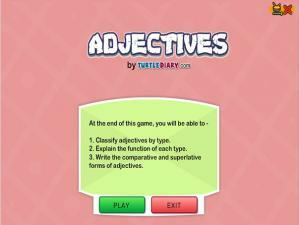 Practice superlative adjectives while you play this fast paced game. Click the rope until the pictures match the adjectives in the correct order, then click the hat! Learn the difference between commonly confused words this, that, these, and those in this video lesson. Improve your conversations! Learn one of the ways to use the determiners "some" and "any" in this tutorial. Study the rule, then complete the exercise! 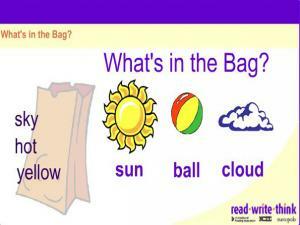 A fun, guessing game to help you see how simple adjectives describe a noun. Can you guess what is in the bag? 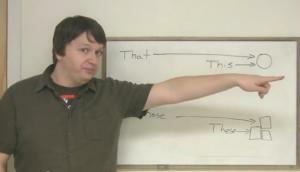 Learn how to use the words "some" and "any" in this video lesson. 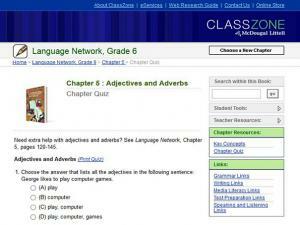 Complete the oral exercises, then review the grammar notes and complete the online exercises! Learn some important parts of speech in this tutorial. When you're done reading, play the games and take the quiz to test your knowledge! 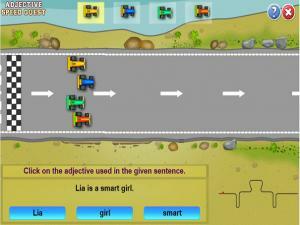 This racing game is all about identifying adjectives. 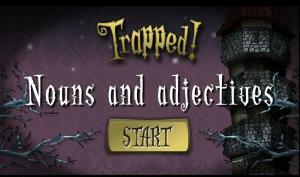 Players are given a sentence with an adjective at the bottom of the screen. Identify the adjective from the given options and click the correct one in order to win the race! 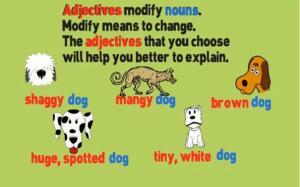 A very good lesson using a song about adjectives as a memorable tool to help students learn and understand adjectives. 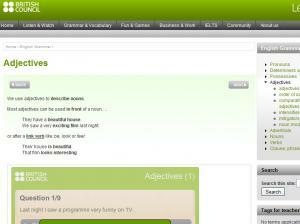 The video is very clear highlight adjectives, nouns and how to use them to various describe things. 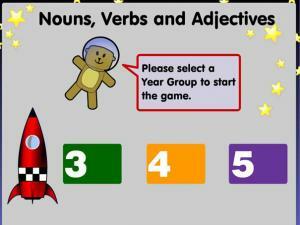 Learn about nouns and adjectives in this fun game. Challenge yourself to put the crates into the correct rooms of the haunted house! 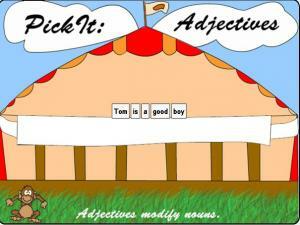 This page offers an introduction to adjectives and how to use them. 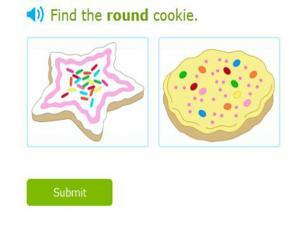 Take the quiz at the end to test your new knowledge! 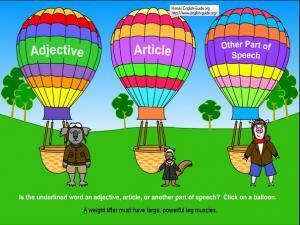 This page explains the different types of adjectives and their correct order in sentences. Test yourself with the exercises! 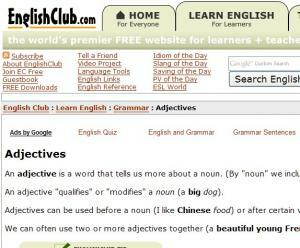 Read the sentence and click on the adjective. Remember, adjectives describe nouns. How many can you pick correctly? Do you have a pet? Learn to compare different types of pets in English using adjectives that describe personality. In this lesson you will see two friends talking about what type of pet they could get. You will learn several adjectives to describe personality and how to make comparisons using "as" to describe equality and "more than" to describe inequality. 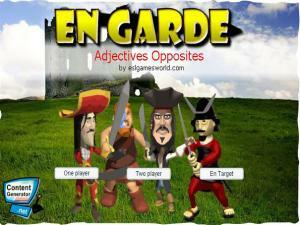 Learn to use comparative and superlative adjectives with these interactive oral exercises. 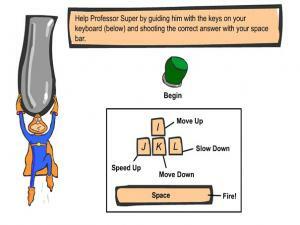 Test yourself with the printable and on-line exercises! 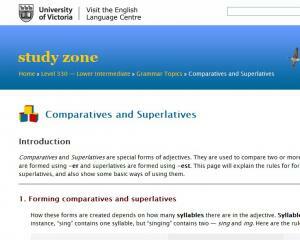 This page will explain the rules for forming regular comparatives and superlatives. Follow along with the examples to practice! 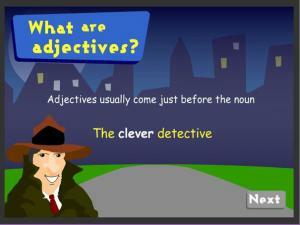 Read the sentence and identify the adjective that describes the noun. Click on SUBMIT and check if you are right. A full explanation is given for any incorrect answers. This game gets you to identify different types of words. Click on the balloon that best describes the underlined word. Is it an adjective, an article, or another type of speech? 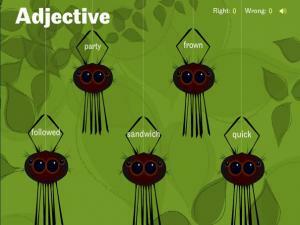 Use this game to help you recognize adjectives. Click on the spider labelled with an adjective to feed it a fly. There are verbs, and nouns as well as adjectives so read each word carefully! For every correct answer you will get a new set of words. 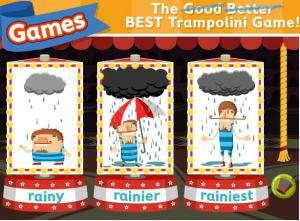 Another fun game from the British Council. Can you find the right pet to match the description? 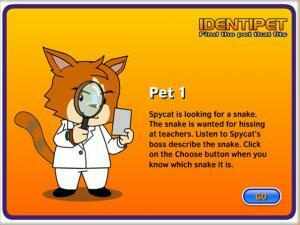 Read or listen to the description of each pet and click on the picture of the one you think it is. 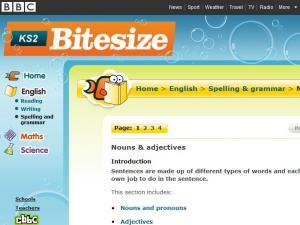 Learn how to construct superlatives in English like "the biggest" or "the best". 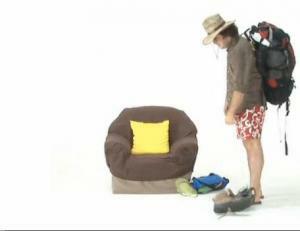 In this beginner English lesson you will watch two friends talking about where to go on a beach vacation. They describe which types of beaches they like best. You will learn the English grammar to make superlatives using the "-est" ending on short adjectives and "the most" for longer adjectives. Learn how to correctly use ‘much’, ‘many’ and ‘a lot of’ in English. 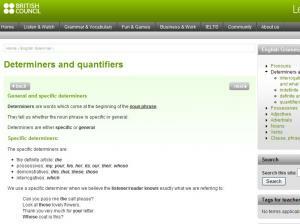 These are called quantifiers, and in this lesson, you’ll learn how to use them and avoid common grammatical errors. Before watching this lesson, you should know about countable and uncountable nouns. 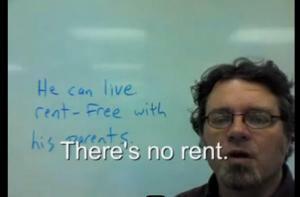 Using "free" as a Suffix; Create an Adjective Meaning "No"
This simple grammar video lesson explains how to use "free" as a suffix. After this video you'll be able to use this casual term in your English conversations! Learn all about adjectives to describe people, items (like houses and animals) and entertainment (like films) with the factsheets and then complete the worksheets for extra practice. There's a challenging matching game for practice, too! When you've finished, take the self-test and check your answers to see how much you learned about adjectives. 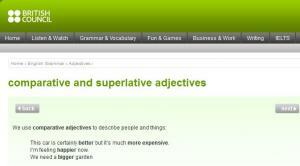 This video lesson covers the use of superlative adjectives. After you've watched the lesson you can take the quiz below to see what you've learned! 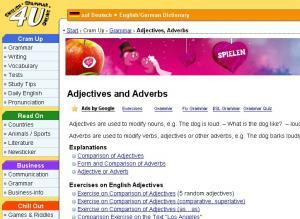 This page offers an explanation of adjectives and tips on how to use the different types. There's a short self-test, too! 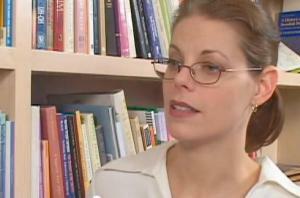 This video lesson explains some rules for using comparative adjectives. Take the quiz at the end to test your knowledge! 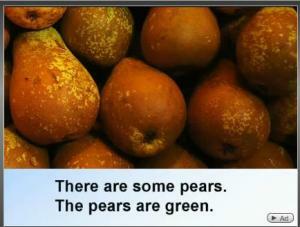 Listen and learn about comparative adjectives in this video lesson. 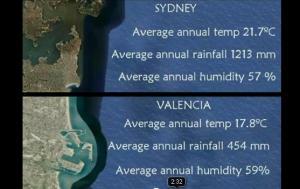 Take note of the adjectives you hear in this presentation comparing the cities of Sydney and Valencia. Look at the examples of comparative and superlative adjectives and take the review test to see if you have understood. This video focuses on the irregular comparative and superlative forms of "good", "bad", and "many". Watch the video to learn more! 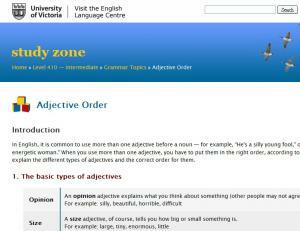 This page briefly explains how to use adjectives, especially concerning sentence order. See examples and then play the games to learn even more. 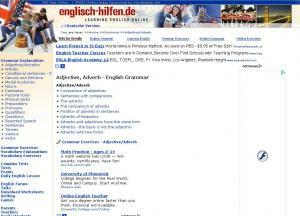 Comprehensive source for practicing adjectives, including order, comparisons, participle adjectives and more. 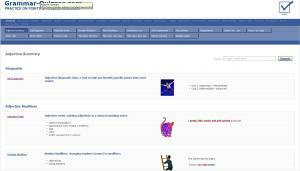 Includes quizzes and detailed explanations. Choose the correct picture to match the adjective description above. Check your answer to see if you are right. There is a great explanation for any answers you get wrong so next time you will be sure to get it right! 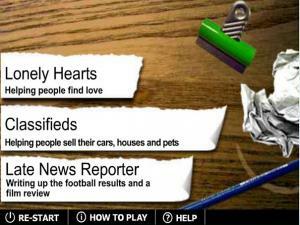 Read all about it adjectives game. In this game, you are a news editor and you need to alter some stories to make them more interesting, positive, and exciting for your readers. A great site to develop writing skills as well as using adjectives to describe people, things and events in a more exciting, engaging way. 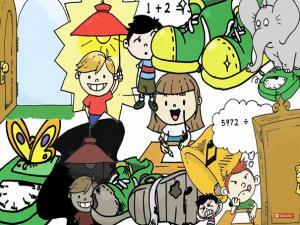 Take this quiz and learn how numbers can be used as adjectives. 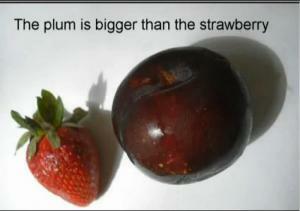 Read the sentence, look at the picture and choose the correct number adjective to describe what you see. Don't worry if you get any wrong - there is a great explanation given for each question! This is a very good, short video explaining the difference between present participle adjectives and past participle adjectives, followed by an opportunity for students to practice the target grammar. Talks about adjectives and words that go with them. You are suggested to visit http://learnenglish.britishcouncil.org/en/word-street/notting-hill-scene-1 first to understand more on the context. 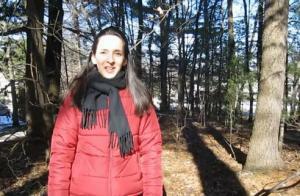 Learn to describe the weather in English using comparatives. 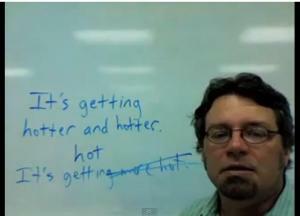 In this English lesson you will see two friends comparing the weather in Shanghai to the weather in Los Angeles. You will learn how to construct simple comparative sentences in English using the "-er" ending for adjectives. 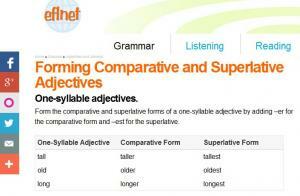 Learn the rules to form Comparative and Superlative adjectives of all types of adjectives: one-syllable adjectives (by adding –er for the comparative form and –est for the superlative); two-syllable adjectives (form the comparative with more and the superlative with most); adjectives with three or more syllables (form the comparative with more and the superlative with most), and irregular adjectives. 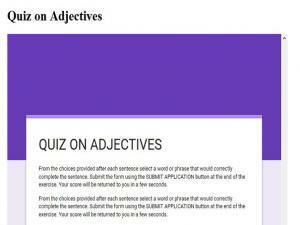 Take this quiz on adjectives to test how good your understanding is. 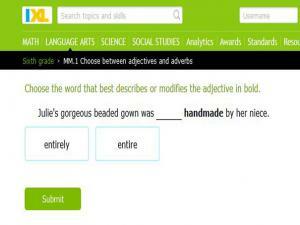 From the choices provided after each sentence select a word or phrase that would correctly complete the sentence. Comparative is the name for the grammar used when comparing two things. The two basic ways to compare are using as .. as or than. Look at the examples of comparatives, superlatives and the different forms for one, two, three-syllable and irregular adjectives. There is a quiz to test your knowledge at the end. Take aim and get ready! Read the sentence and use the keyboard controls to shoot the correct comparative adjective for each word in RED. Did you eat all of the cake? Did you eat every cookie? 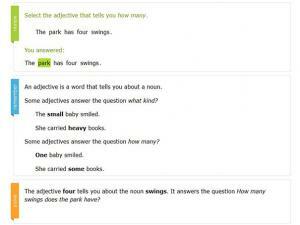 These questions are similar, but use different words. The teacher on the video explains when to use "all" and when to use "every." Leave questions or comments for the teacher or other students to chat about this topic. Talks about the words 'so' and 'such', '-ing' and '-ed' adjectives and 'me too' and 'me neither'. You are suggested to visit http://learnenglish.britishcouncil.org/en/word-street/notting-hill-scene-2 to understand more on the context. You may have heard of articles (a/an/the), but do you know they are in the large family of determiners and quantifiers, including demonstratives, possessives and interrogatives? Learn how to use these words with specific, general, singular and plural nouns. 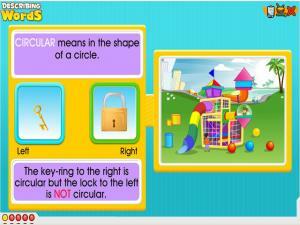 After you have read the explanations, try the game to learn even more! Sophie talks about the best place she has ever visited. Listen how she describes all of her fabulous vacations then put the same words she uses into the text. This lesson is about using words to describe people, places and things. Watch this video grammar lesson to learn about the casual usage of double comparative adjectives like "better and better" or "more and more." Learn to use these phrases to speak like a native! 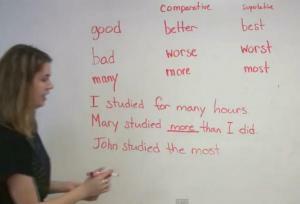 This video talks about Double comparatives (as in "The more, the merrier.") Using comparative forms to express cause and effect. Learn how to describe yourself and your best professional qualities in a job interview. 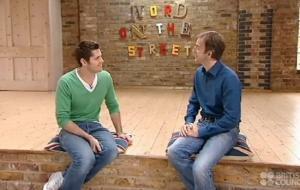 In this advanced English lesson you will watch a man interviewing for an accounting job. He uses several compound adjectives to describe his skills and personality. 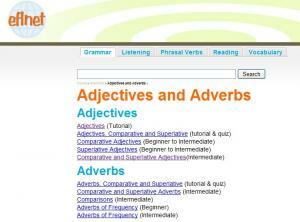 You will learn how to form compound adjectives by combining two nouns, adjectives or adverbs. Learn how to combine adjectives with prepositions to talk about your fears. In this advanced English lesson you will see two people talking about making presentations at work. One person enjoys public speaking but the other is afraid of being in front of so many people. Learn how to talk about dating and romance in English by using "so" and "such" combined with adjectives. In this advanced English lesson you will see two girlfriends discussing their love lives. One woman is having a hard time finding a boyfriend and the other gives her some advice. You will learn some common expressions for talking about dating. Watch this basic video as the teacher goes through a number of sentences and explains what and where the participle is. Try and work out which word is the particle, and which is the participle phrase before she shows you the answer. 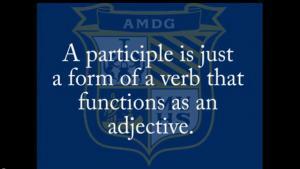 Good for a review of your understanding on participle phrases. 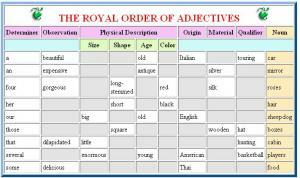 This page offers complete and detailed information and examples about using adjectives, from basic definition, comparatives to adjectives order. It is a very good material for serious students. It is fun to learn adjectives, because it gives you the ability to more accurately describe and explains things. 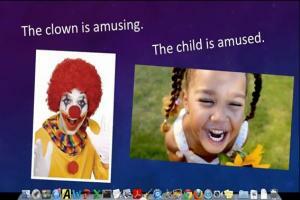 First, listen and watch the lesson on adjectives. Then, there are 7 exercises and 1 game to help you practice your new knowledge. You can also go back to the lesson to check anything you need!